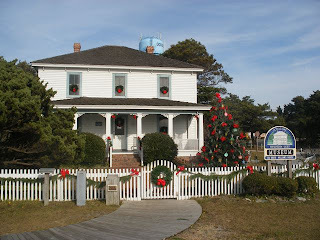 Molasses Creek Journal: News from Ocracoke Island and Beyond: Happy Holidays from us all at Soundside Records! Happy Holidays from us all at Soundside Records! 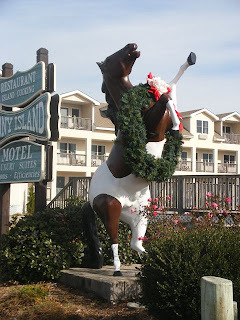 Everyone on Ocracoke is hanging wreaths and twinkling lights and getting into the yuletide spirit. 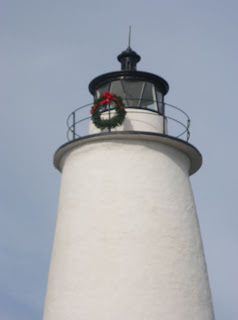 It’s beginning to look a lot like Christmas around the village – even the lighthouse is sporting some holiday finery. Lots of festive and fun events happen this time of year (see last week’s post for a full listing), but we’d like to give you an extra reminder about the annual Ocrafolk Christmas Concert on December 11th at 7pm at the Ocracoke Community Center. In years past, Deepwater Theater has hosted the concert and charged admission as a fundraiser for OPS. But this year it will be a free event for the whole community – and visitors, too! If you’re on the island, come on out and enjoy seasonal entertainment provided by some of your favorite Soundside Records artists and other local talent: The MadriGals, Jamie Tunnell, Coyote, Molasses Creek, Sundae Horn, Rob Temple, Caroline Temple, Molly Lovejoy, Katie O’Neal, Ivey and Laura Belch, Baby Dee and Free Moustache, Kati Wharton, Noah Paley, April Trueblood, Cynthia Mitchell, Roger Garrish, & more!! And in keeping with the spirit of giving, the Ocrafolk Christmas Concert organizers are offering space inside for some of our island’s non-profits to raise a little money selling refreshments. ...and here it is, just in time to influence your Christmas shopping! trove of oral history was in danger of extinction so he began to collect stories in earnest and to write them down. As his story-telling reputation grew, Philip became a regular feature of the Ocrafolk Opry, a summer variety show at the Deepwater Theatre where he has entertained audiences for the past several years. In 2000, he began publishing some of his tales online in his Village Craftsmen newsletter. Three years ago, he began conducting evening “ghost walks” through the village. The 90-minute walks quickly gained popularity and participants began to pressure Philip to publish the stories so they could take them home. Digging Up Uncle Evans: History, Ghost Tales & Stories from Ocracoke Island, and it’s available right here at Soundside Records. 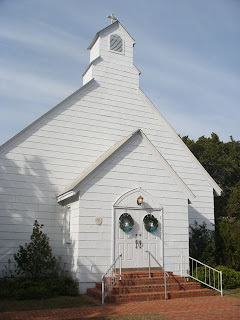 While the main focus of the book is ghost stories, there is a wealth of Ocracoke history and geography, as well as a scattering of interesting photographs. Digging Up Uncle Evans is the perfect holiday gift for anyone who loves Ocracoke. …did we mention Soundside Records? 2008 was a great year for Soundside Records, seeing the release of three new CDs for our catalog. The Ocrafolk Sampler IV joined the lineup this spring, and proved to be another great compilation of local and regional musicians. Perennial Ocrafolk artists Molasses Creek open the CD with “Stuff that Works” and it sets the tone for the rest of the CD – “music that works” its magic on the listener. New to the Sampler series are Katy Mitchell, Skye Zentz, Michael Stanwood, Phil Kelly, Ruth Wyand and The Barnraisers – all of whom performed in the 2008 Ocrafolk Festival. Born of years of musical friendship, this album brings together these two musicians in a wonderful tapestry of song and tunes form the mountains of Colorado to the sandy shores of Ocracoke Island, NC. This is the album that will teach you the magic of the words “Ee Go Di Wa” and get you swaying to Fiddler Dave’s beautiful waltzes. Hatteras Islander Noah Paley teamed up with the Ocracoke duo Coyote to offer a night of “Songs and the Stories Behind the Songs” and the result is this CD recorded during the 2007 Friday night shows at Deepwater Theater. For Christmas delivery please place orders by December 15th! With every passing year, more visitors to the Outer Banks of North Carolina take home a piece of the Ocrafolk magic through our performers’ many CDs. In our catalog you may browse performers’ recordings -- sampling as you go, or search song titles and special guest appearances on other albums. We have also identified those albums by Ocracoke residents and those produced at Gary Mitchell’s Soundside Studios. Some albums even have lyrics for those who wish to sing along! This last weekend Guitar Gary, Fiddler Dave, Lou Castro and Gerald Hampton convened in Harker's Island, NC for the annual Waterfowl Weekend. Several other performers were on hand for the celebration including Bland Simpson, the Lost Girls, Connie Mason, and a bunch of Fish House Liars (Rodney Kemp and friends). The weather was a little chilly, but still sunny enough to stand outside and eat scallop fritters and apple puppies while a group of local boatmakers created a skiff right in front of the museum. The Core Sound Waterfowl Museum is a wonderful place to visit any time of year with plenty of exhibits on hunting, carving, and Down East Culture. Find out more on their website at www.coresound.com. Ocracoke Pizza Company Call if you see the Open sign lit up! Howard’s Pub Open 11am – 10pm, Fridays and Saturdays until midnight. The Pub will close for the season on January 4th. Thai Moon Carryout Open Thursday – Sunday, 11am ¬– 8pm, until December 30th. Closed Christmas Day. Creekside Café Open through mid-December from 10am – until 7pm. Ocracoke Station Deli (At the Texaco station) Open year round. Jason’s Restaurant Currently closed. Will re-open December 30th serving lunch from 11:30–2:30 and dinner from 5 – 8pm. Please note that other shops may be open – if you don’t see your favorite one on the list, please give them a call. Deepwater Pottery and Books to Be Red Open daily 12 – 5. Open house Saturday, December 6th from 1 –4pm. Over the Moon Hours will be posted on the door. Village Craftsmen Open Tuesday – Sunday from 10am – 5pm. Closed December 23rd – 25th. Open Dec. 26th until December 31st, then closed for the season. BW’s Surf Shop Will be open most days in December. Tradewinds Open daily until January 4th, then closed through February. Island Artworks Open Tuesday – Saturday, 10 – 5. The Gathering Place Open weekends in early December, and part-time hours daily from December 18th -31st. Open House Saturday, December 6th from 1pm -4pm. 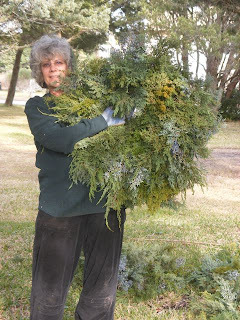 Island Ragpicker Open daily at 10 am through December. Closed Christmas Day. Zillie’s Island Pantry Open daily, Noon – 6pm, through December. Closed on December 24th and 25th. Closing at 4pm on the 31st and closed January 1st. Zillie's will be open in January and February, hours to be posted. Secret Garden Gallery Open December 15th – 23rd (except Sunday), 10am – 6pm. Open Christmas Eve 10am – 1pm. Closed Christmas Day. Open December 26th ¬– 31st, 10am – 6pm. Closed Sundays. Village Peddler Open most weekdays in December, and the weekend of December 20th and 21st. ¬Phone number is posted on the door – please call and they’ll open for you. Wow! At last I got a webpage from where I can in fact take helpful facts concerning my study and knowledge.